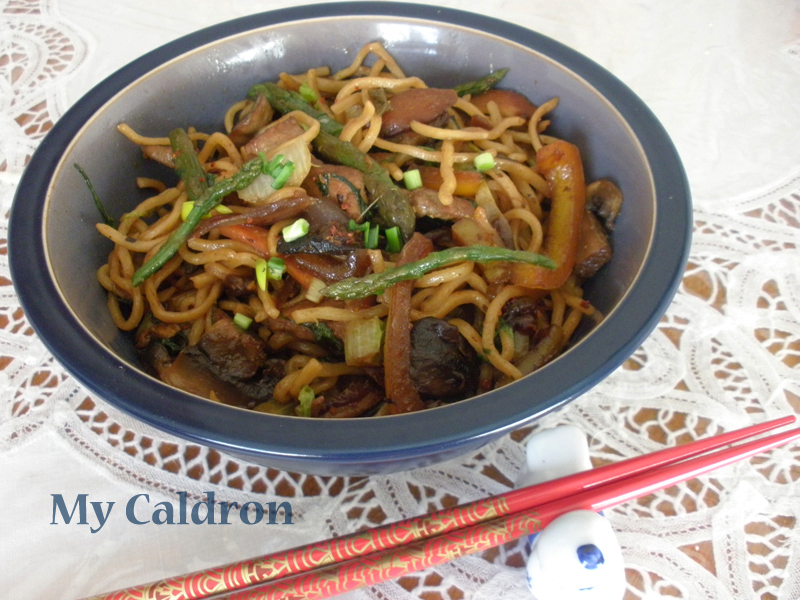 There are as many different ways of making Chinese style noodle dishes as there are verities of different noodles, vegetables, meats and their combinations. Whatever the combination though, there are three rules to be applied to come up with nice looking and tasting Chinese noodle dish. 1. Noodle rule: Always go with high quality Asian (ideally wheat) noodle, such as “Chow Mein” or; they won’t go mushy in the boiling process. 2. Meat rule: If you prefer veal over chicken, go with high quality tender veal – Lion would be perfect and cut them in thin slices and then narrow stripes; this way they can be fry cooked very quickly without losing the taste or tenderness. I usually buy the paper-thin slices made ready for Chinese Fondue meal. Note: 1. It would be good to add 1 teaspoon of grated ginger (I am allergic to it, so I did not use it) 2. And as for the vegetables, as mentioned before, there is no way of going wrong with this. You could for instance use shredded cabbage leaves, and omit any of the above items on the list. Just go with your creativity and taste preference. Wash and dry the sliced meat. 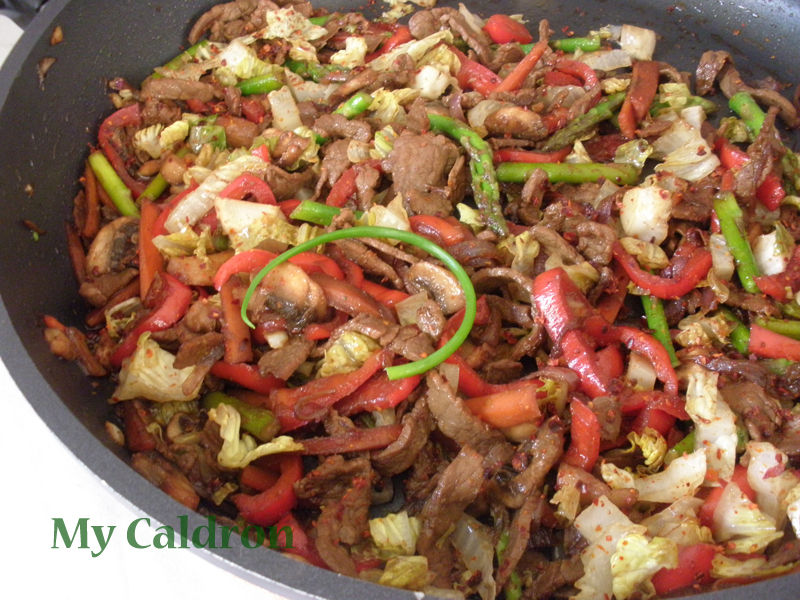 Heat vegetable oil in a wok or large frying pan and brown the meat over high heat for 2-3 minutes. Add 1 tbsp. soy sauce and continue frying for another 1-2 minutes. 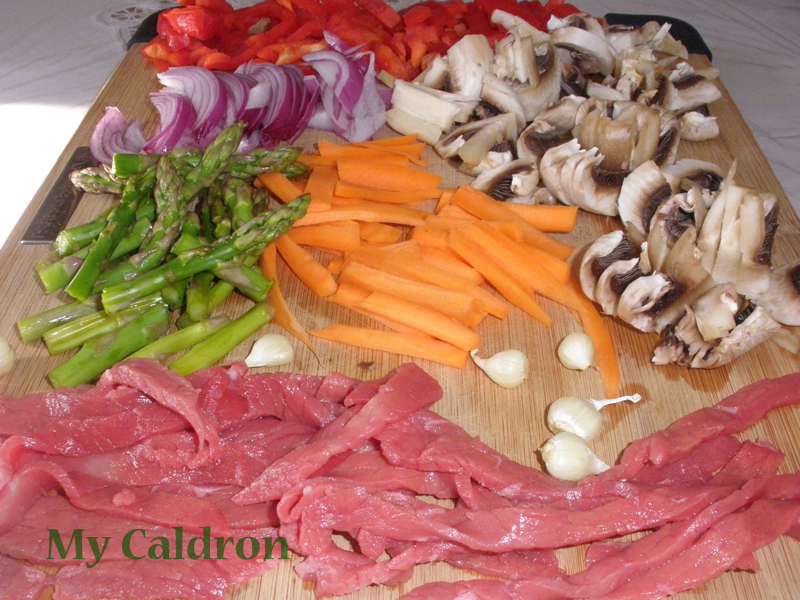 Add all your vegetables in to the pan, starting with the more hardy ones, such as carrot, onion and bell pepper. Garlic and lettuce go in the fraying pan at the very last. Keep frying over medium heat until vegetables are tender but not mushy. Cook the noodles in boiling water mixed with a pinch of salt for about 3-4 minutes or until it is soft but not mushy. Drain and briefly rinse under colder water. Set aside. 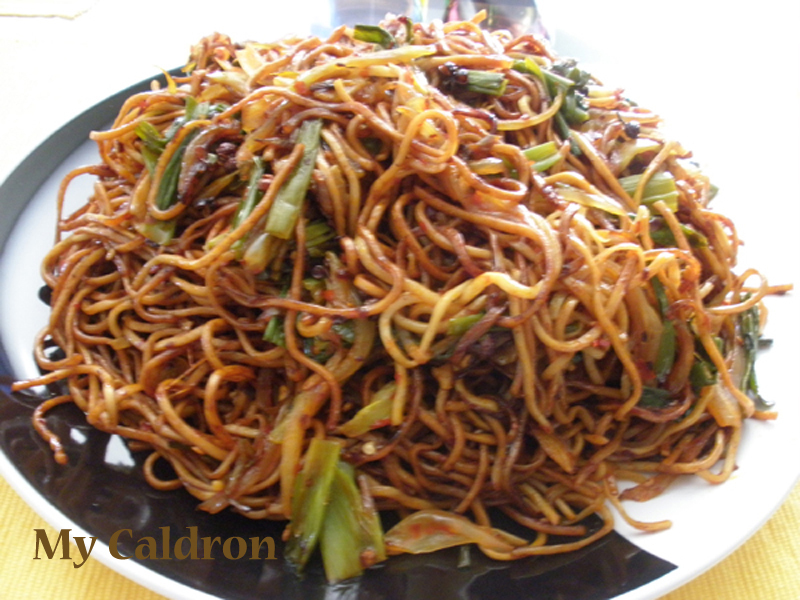 Add cooked noodles in the frying pan, add the remaining of soy sauce and chili pepper and mix well.